If you’re looking for ways to really enjoy your garden but hate the thought of having to maintain it, one thing you could consider is removing your lawn or any other grassy areas within it. It’s this garden feature that requires the most care, and there are plenty of garden landscape suggestions that can make your garden absolutely gorgeous without grass. Of course, it could be that your garden is already grassless but could do with a refresh. Whatever your reason for wanting some tips for garden landscaping without grass, we have what you need here. Read on to discover some of the best tips and features of garden landscaping without grass. Without a lawn, there needs to be another focal point to your garden, one that catches your eye and brings all the features together. Paving is a fantastic alternative focal point if you’re looking to landscape without grass, and with so many options in terms of materials and colours, you’re bound to find paving that’s perfect for your own tastes. 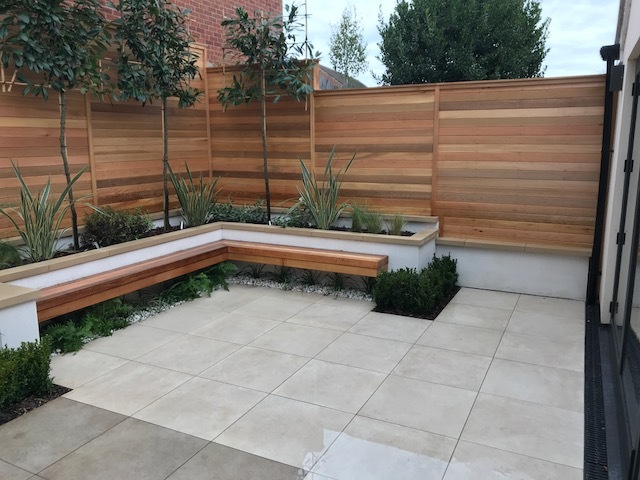 If you have a smaller garden, it’s very easy and effective to cover the area with a light coloured paving, to kickstart what is bound to be a lovely garden when everything comes together. However, for larger gardens, it’s recommended that you just use paving to create a pathway through the garden and its features, rather than covering the whole area with one material. Paving in larger gardens should be paired with bedding areas, along with a dining area or a large water feature, to name just a few examples. Every garden should have at least some shrubbery or greenery within it, to maintain its natural atmosphere and to create a sense of calm. There are plant options for even the most novice of gardeners and for those who want to spend as little time as possible pruning their garden. If you fall under either of those categories, it’s wise to invest in some mature and/or evergreen plants or shrubs, that require as little maintenance compared to any other type of plant. The likes of Lavender and Camellia make fantastic additions to a low-maintenance garden without grass, and will instantly pique the attention of whoever steps foot into the space. Top Tip: Where possible, opt for native plants to add to your flower beds. They will be much more tolerant to the weather and temperatures here in the UK and as such, will require minimal attention once they have been planted. If you are planning on having some plants and shrubs in your garden, it’s well worth installing some flower beds for them to sit in, rather than keeping them in pots. Potted plants require a lot of care and attention, unlike those planted in more ’natural’ spaces such as a flower bed. You can make flower beds work to fit in with your garden space, no matter how small or large your garden is. With some careful thought for your landscaping design, you can have an abundance of bedded plants that blend seamlessly with the rest of your grassless garden. Flower beds can be level, raised, lowered or even tiered, so there’s plenty of choices when it comes to fitting them in with the rest of your garden landscaping. A wild garden, or ‘wilding’, is becoming a popular trend amongst homeowners, whether that’s to help attract more wildlife to their gardens, or simply so they don’t have to maintain them as much as they would a typical garden layout. If you’re looking for a low-maintenance garden without grass, but still want to have heaps of natural elements to your landscaping, then a wild garden look might be a suitable choice for you. By carefully choosing the rights plants, trees and shrubs to include in your wild garden, you could have an extremely natural looking garden in no time, yet one that requires little effort at the same time. Of course, if you simply don’t want to have to maintain the grass in your garden but would like to keep the garden looking the same, there’s always the option of investing in some artificial grass. With so many different styles, colours and textures available these days, artificial grass now looks much more natural than it once did. In fact, you could have guests fooled into thinking you have a perfectly kept lawn, all whilst saving the time you would have spent maintaining your garden, for relaxing instead!